Jeffrey Dahmer Killed Adam Walsh. 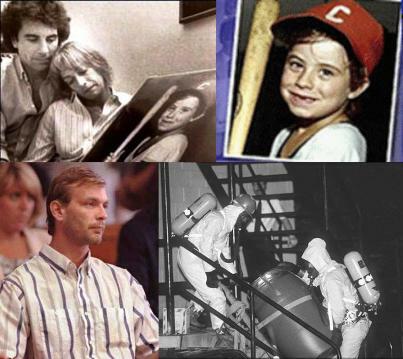 The abduction and murder of 6 ½-year-old Adam Walsh, who disappeared in 1981 from a Florida mall, is one of the most famous missing children cases in America. John Walsh remains convinced the killer of his son was drifter Ottis Toole, now deceased. Walsh’s longtime friend and colleague Joe Matthews has been investigating the case for a year and says he has evidence of Toole’s guilt — although the crime remains officially unsolved. But in those chaotic early days of the investigation, in a time before amber alerts and DNA, what clues may have been missed? Now a fascinating new theory has surfaced: Could one of the most famous murders of our time have been the work of one of the most famous murderers of all time? For the past 11 years, a true-crime author named Arthur Jay Harris has been investigating the case on his own, and he has uncovered a shattering revelation. Who was working only minutes from that mall that morning? Jeffrey Dahmer, the serial killer. previous post: Sailor Moon Games. next post: Elvis Died Today. volunteered with the Central Valley Aids Team located in Fresno, CA back in the late 80’s – early 90’s. By all accounts, a nice lady. NO J.D. WOULD NOT BE INTERESTED IN LITTLE BOYS. NOT ENOUGH MEAT ON THE BONES FOR ONE PLUS HE WOULD HAVE PREFERED TO KEEP ADAMS HEAD AS A TROPHY NOT TOSSED OUT IN THE SWAMP. OTTIS FIT THE PROFILE MUCH BETTER AND HAD FAR TOO MANY DETAILS OF THE CRIME THAT WAS NEVER RELEASED TO THE PUBLIC AT THE TIME OF HIS ORIGINAL CONFESSION. COULD THEY HAVE WORKED TOGETHER? THEY HAVE BOTH BEEN PROVENTOBE IN THE AREA AT THE TIME AND WERE BOTH “SUPPOSED” MEMBERS OF “THE HAND OF DEATH” CULT. hellish acts. God Bless and keep you Adam Walsh. Your are in our prayers John Walsh. 51 queries in 1.087 seconds.